Homemade Broccoli Cheese Soup - Better than Any Restaurant! 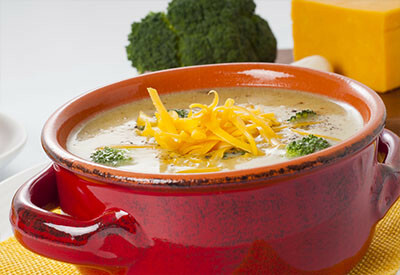 Broccoli cheese soup is one of the most popular soups sold in restaurants. In fact, even fast food restaurants have gotten on the craze of serving this delicious, creamy dish. 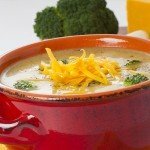 Broccoli cheese soup served with freshly grated cheddar cheese. Although we love to eat soups and salads for lunch, the restaurant varieties are often laden with sodium and some with unnecessary preservatives. We make all of our own soups from scratch so that we know exactly what ingredients are going into them. We love to make soups from our garden fresh vegetables in the summer and fall. See: The Best Soup Recipe. Each time we try to make a big enough batch so that we some left over to freeze. In the middle of the cold winter we just pull a ‘brick’ of soup out of the freezer, heat it up, and the summer goodness is back on the table. 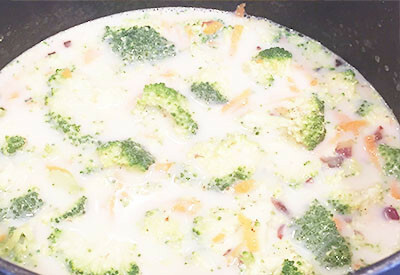 However, Broccoli Cheese soup is one of the soups that we love to make in the winter months. We either use frozen broccoli from our summer time harvest, or use fresh broccoli from the store. The key to making the best broccoli cheese soup is to use freshly grated cheddar cheese! The key to the absolute best broccoli cheese soup is to use freshly shredded cheddar cheese. Not the type that you find in the packaged aisle at the grocery store. 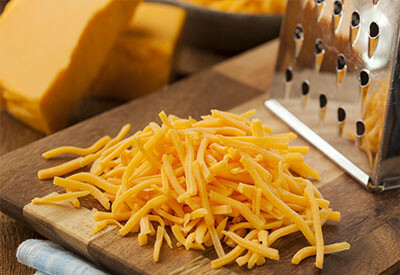 Those pre-shredded cheeses contain anti-caking and anti-mold preservatives that makes melting the cheese more difficult. Not to mention, they are unnecessary additives that are in the food. Grating both the carrots and cheeses are easy to do. Just slide them across your grater and you have fresh and healthier options. For small grating jobs, we love to use our Mandolin slicer that comes with a grating shield. Just pop in the blade and in seconds you have shredded carrots and cheese! Broccoli and carrots in chicken stock and milk, boiling until tender. 1. In a large stockpot over medium heat, add olive oil. 3. Turn burner to medium-low, whisk in the flour and stir for 1-2 minutes. 4. Add broccoli pieces, shredded carrots, broth, milk, salt, and pepper to the pot. Stir, bring to a boil and reduced to a simmer for 10 minutes. 5. Using a hand immersion blender, blend until smooth. *You could also fill a blender 1/2 full and blend in batches – do NOT overfill. 6. Stir in heavy cream and cheese until warm and melted. In a large stockpot over medium heat, add olive oil. Turn burner to medium-low, whisk in the flour and stir for 1-2 minutes. Add broccoli pieces, shredded carrots, broth, milk, salt, and pepper to the pot. Stir, bring to a boil and reduced to a simmer for 10 minutes. 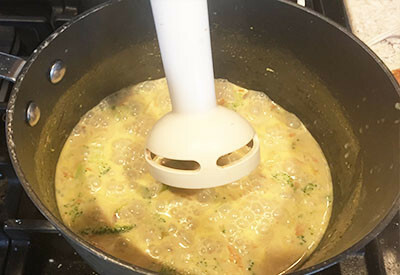 Using a hand immersion blender, blend until smooth. *You could also fill a blender 1/2 full and blend in batches - do NOT overfill. Stir in heavy cream and cheese until warm and melted. ← The Raised Row Garden Method. No Tilling, Less Weeding, More Fun! Thanks – that’s a great help. I don’t have a scale. So how much is 1 1/4 lbs in cups? We usually get 6-8 servings. However this of course depends on the size of your bowls. Hope this helps! Hi Diana You can use old plastic containers, however you do run the risk of ice crystals developing on top of the soups as they aren’t perfectly air tight. But that is how we grew up too! Great Suggestion…is it feasible to use old butter tubs or small plastic Ice cream containers for long Periods of time this is what my Aunt used to do for the Family. Hi Jill Great question…. We use Rubbermaid 4 cup rectangular containers to initially freeze the soup into ‘bricks’. We then use our food saver if we anticipate they will be used for long term storage. Hope that helps! I can’t wait to try this recipe. Question…when you freeze your “brick” of soup, what are you freezing it in? I am trying to create my own vegetable stock that also talks about freezing in sealed containers. Any suggestions?